Actually this hotfix seems to be focused on the support of tessellation for the latest HD 6900 series. You can download Cat 11.1 hotfix HERE. The Catalyst Control Center includes an early prototype of some new tessellation controls. Our goal is to give users full control over the tessellation levels used in applications. The default selection “AMD Optimized” setting allows AMD, on a per application basis, to set the best level of tessellation. The intention is to help users get the maximum visual benefit of Tessellation, while minimizing the impact on performance. Currently no applications have been profiled, so the “AMD Optimized” setting will be non-operational until further notice. 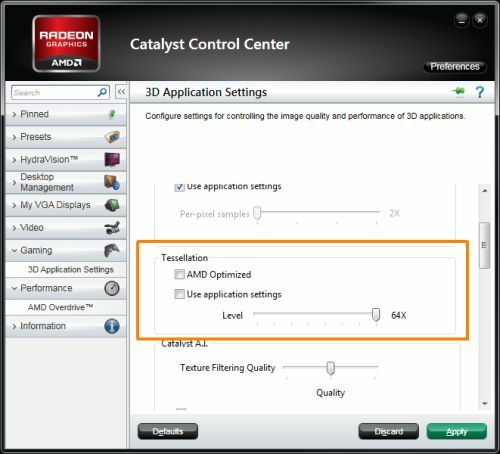 The long term goal for the “AMD Optimized” setting is to use the Catalyst Application Profile mechanism to control the AMD recommended level of tessellation on a per application basis. AMD’s intention is to set the tessellation level such that we will not be reducing image quality in any way that would negatively impact the gaming experience. I’m currently testing Cat 11.1 and tessellation support in OpenGL is not really what AMD claims in the press release. Stay tuned!